Birchbox is a service that packs five to six samples of high-end beauty products, whether it be skin care, hair care, makeup or nail care in a cute little brown and pink box each month. The box is customized for each client depending on their product interest. I have found that it is a highlight of my month to open that little box and find new goodies to try out. Mind you, these "samples" seem to last me a couple of months each. Kerastase's Elixir Hair Oil is my new favorite product. Every winter I notice a difference in my hair and I have been searching for a product to remedy its dryness and thin appearance. I color treat my hair and it seems to look and feel fairly healthy in the summertime, but the winter brings a dull, flyaway appearance no matter what products I try. My hair stylist finally recommended Kerastase Elixir Ultime. It is a bit pricey at $58 for 3.4 ounces but I have been using it for over a month and it is only about 1/4 gone. I use about 3 pumps after I wash my hair before blow drying and it seems to return the moisture and healthy feeling to my hair. Especially the last few winters, my hair has felt thinner (which is unthinkable because my hair has always been so naturally thick) but I feel as though I have finally gotten my hair back!! Before blowdrying, I will usually also put a heat protectant on my hair. Then after blowdrying, I will put a pump or 2 of the Kerastase elixir through the ends of my hair to add some extra shine and moisture. I will expect to have to modify my routine when the weather changes my hair will probably not need as much help, but for now this product has changed my hair for the better! 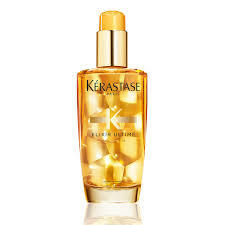 My stylist told me that is is Kerastase's longest running product, so I am sad that I have not tried it sooner.